In his time, George Rainsford Fairbanks was an attorney, historian, citrus magnate, newspaper editor, soldier, author, and a politician. Though he was born in New York, Fairbanks adopted the state of Florida as his home for most of his adult life. He helped found the Historical Society of Florida and served as its first Vice President. Fairbanks was also one of the co-founders of the University of the South in Sewanee, Tennessee. He was a great friend and colleague of David Levy Yulee, his father Moses Levy, and William Pope Duval. Moses Levy, the owner of significant tracts of land in Central Florida, engaged Fairbanks to tend to his many pressing legal matters. Fairbanks also served on the board of directors of Yulee’s Florida Railroad, and owned stock in the company. His lifelong thirst for knowledge made George Fairbanks one of the brightest and most well-rounded minds of his day and a great chronicler – not to mention a part of – Florida’s history. In 1856 he helped to found the Florida Historical Society, and served as its Vice President. Born in Watertown, New York on July 5, 1820, George was the second son of Jason and Mary Massey Fairbanks. Although George was born into a fairly wealthy family, his father and maternal grandfather had both recently earned their respective fortunes. Jason was a self-made man with little formal education who parlayed his skills as a tanner into several business ventures, eventually employing up to 500 people. He was also a respected public servant, serving as a county sheriff and treasurer and as a U.S. Marshall for almost 30 years. Mary Massey’s father built a lumber mill and settled his family in the area that would become Watertown before it was a city. Mr. Massey bought a great deal of property, and with the city’s expansion, became a wealthy and powerful man. Though his mother was a staunch anti-catholic, George was sent to school at La Petit Seminaire in Montreal Canada, a Catholic school for boys which provided a top-notch education. English was banned at the school, and George was forced to speak only in French. A cholera epidemic forced him to return home in 1832, where he spent the next four years preparing for college. Fairbanks graduated from Union College (the first interdenominational institution for higher education in the United States) in 1839, and began to study law. In 1842, he became engaged to Sarah Wright, a judge’s daughter, and the two were married just weeks before George moved to Florida to take a job as Clerk of the Superior Court of East Florida. Now living in Saint Augustine, George immersed himself in the city’s history and in the history of Florida in General. He learned Spanish so that he could read first-hand accounts from Conquistadors and early explorers. In 1858, Fairbanks’ first history book was published - The History and Antiquities of the City of St. Augustine, Florida. In that same year, George’s wife Sarah died of tuberculosis, leaving him to care for their five children. Two years later, Fairbanks married his brother-in-law’s widow Susan Beard Wright, combining their households; George and Susan had two daughters of their own. When war broke out between the states, Fairbanks endorsed secession from the Union. He was commissioned an officer and served under General Braxton Bragg, with the rank of major. He served in the commissary department and spent most of the war in Georgia overseeing Army hospitals. After the war, Major Fairbanks returned to Sewanee to help rebuild the University of the South, which had been ravaged by four years of conflict. For the rest of his life Fairbanks would spend at least a portion of the year in the cabin he built near campus dubbed “Rebel’s Rest,” which still stands to this day. In 1880, David Yulee invited Major Fairbanks to move to Fernandina to become editor of the local paper, The Florida Mirror. George’s active role in the Episcopal Church allowed him to quickly make connections with some of Fernandina’s most prominent citizens, many of whom were part of St. Peter’s congregation. Around this same time, Fairbanks donated a tract of land near Gainesville, Florida, to build a church for the citizens in a small town that was to be named after him. He brought in New York architect Robert Schuyler to design the building - dubbed “All Saints” at the suggestion of Fairbanks’ wife Susan - and paid for its construction. It was of the utmost importance to Susan Fairbanks to have her children and grandchildren near her at all times, and with a family as large as the Fairbanks’ this necessitated a home of substantial size. In 1885 George turned once again to Robert Schuyler to design and build a home in Fernandina that could accommodate the entire family. The lavish Italianate home featured a 15-foot tower and a fireplace in every room (10 in all), two of which were decorated with English tiles depicting scenes from Shakespeare’s plays and Aesop’s fables. The Fairbanks house was the first home in Fernandina to have an elevator. A long-standing local myth is that upon seeing the house for the first time Susan Fairbanks was so displeased with it, she gave it the moniker it carries to this day, “the folly.” However, the story passed down through the Fairbanks family is that it was the decoration and furnishings that Susan disapproved of, not the house itself. George Fairbanks’ legacy is still alive today in the city of Fernandina, and his impact on his adopted state is undeniable. Fairbanks managed much of his business out of Fernandina, but spent his summers in Sewanee helping to manage the University of the South and ensure the institution stayed true to the original intentions of its founders (of which he has was the last living). In 1898, George published the second edition of his History of Florida, followed by a third in 1904 which added chapters up to that date. This edition was designed for, and used as a textbook in the Florida school system. George continued with his devotion to the University of the South, as a trustee, and never lost his zeal for researching history. He passed away in 1906 at the age of 86 in his home in Sewanee, Tennessee. George Fairbanks’ legacy is still alive today in the city of Fernandina, and his impact on his adopted state is undeniable. His home still stands on South Seventh Street, now operating as a bed and breakfast. 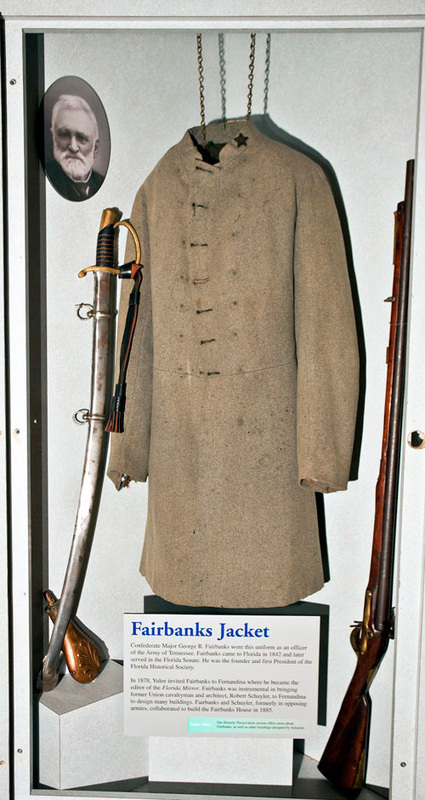 The coat he wore as a Major in the Confederate Army hangs in the Amelia Island Museum of history. The Florida Historical Society he helped found exists to this day, and the books he wrote about the histories of Florida and Saint Augustine are still used as source material in text books read by students across the state of Florida.